Assembling the world’s largest nuclear fusion experiment is now an engineering problem. But it may be the most daunting challenge that has ever been posed, as Stuart Nathan explains. My last visit to the site of Iter, the international project to develop and build the world’s largest ever nuclear fusion reactor and a model for the powerplant of prospective fusion power stations, was three years ago. Then, there was comparatively little to see on-site, as the foundations that will support the enormous weight of the fusion machine were still under construction, and the concrete had yet to be poured. The situation now is very different. 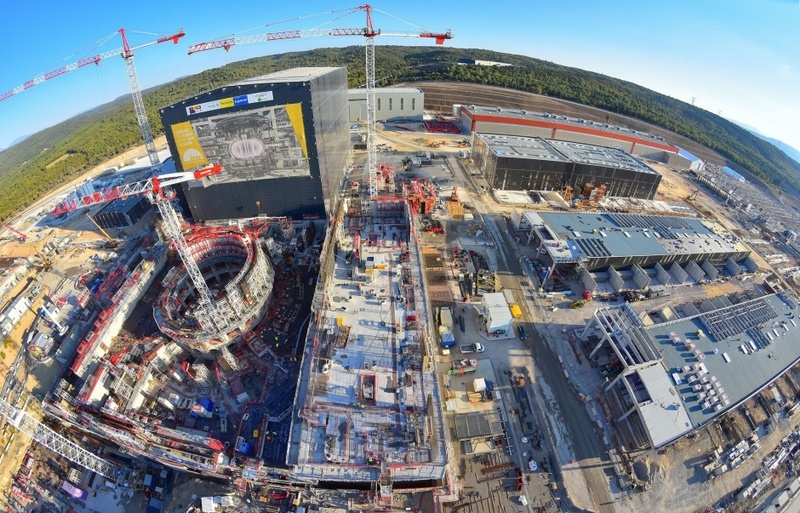 The theoretical and design aspects of the Iter ‘fusion machine’ — as it is known within the organisation — have largely been finalised, and the contracts for construction of its components farmed out among its member states. The remaining task, to piece all 10 million components together, is essentially a programme of mechanical, electrical and process engineering; but what a programme. It will be the most complex machine ever built — an accolade that’s been held at various times in past decades by the Boeing 747, the Apollo command module, The US nuclear missile submarines, and the Large Hadron Collider. 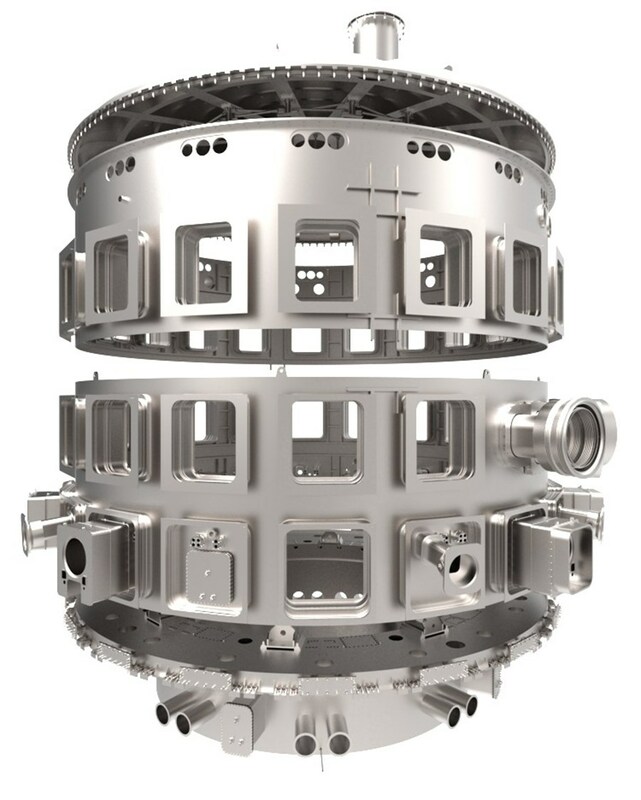 Because of the level of instrumentation and the need to comply with existing nuclear regulations, Iter is currently seen as likely to be the most complex fusion reactor ever built. Returning to Cadarache, near Marseilles, a few weeks ago, progress was obvious from the first glance. The parched, sun-drenched landscape is the same, but whereas previously, only the bones of a few buildings were projecting from the rocky man-made plateau that forms the Iter site, the full complex is now visibly taking shape. The most obvious progress is on the tokomak complex. Forming a T-shape, with the assembly hall to the south and the still-unbuilt diagnostics building and tritium plant flanking the tokomak hall itself to the east and west, the assembly hall is complete and the walls of the square tokomak hall are now rising above the pit where the machine will sit, descending two stories below ground. In the coming months the hall will completely enclose a squat circular concrete tower rising from the pit floor, pierced with rectangular and oval holes. Reminiscent of medieval fortifications, this is the bioshield that will keep Iter’s operators safe from the lethal neutron flux that the fusion reaction will produce in operation. 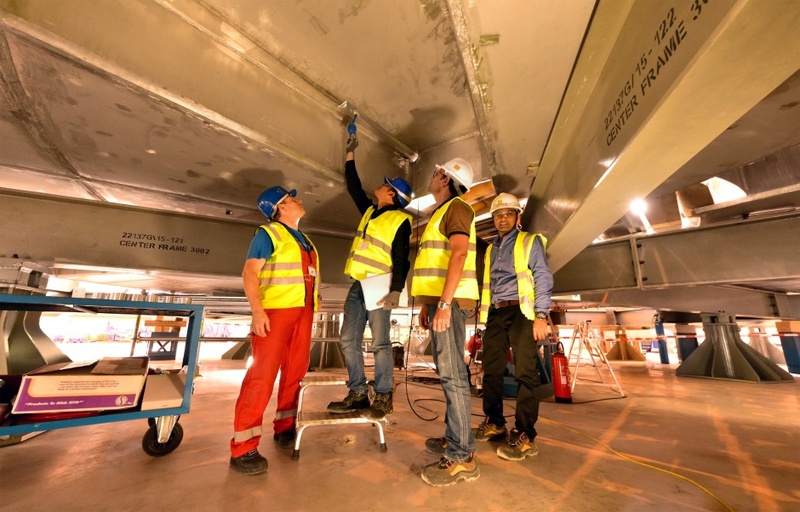 The concrete of the floor, hall walls and bioshield is regularly studded with rectangular steel slabs onto which the fusion machine will be welded to hold it safely in place, in compliance with French nuclear regulations. More concrete supporting structures radiate from the bioshield into the spaces that will be occupied by the equipment that will heat the hydrogen plasma confined by mighty magnets within the tokomak’s toroidal vacuum chamber; to the north will be radiofrequency generators, which will blast in microwave energy, and equipment to replenish the plasma by blowing pellets of frozen hydrogen into it; and to the south — squeezed in between the tokomak itself and the assembly hall, which will then be redundant (and according to jocular staff, the location for dance parties) — will be neutral beam injectors, huge devices that accelerate beams of hydrogen, render them electrically neutral and then fling them into the plasma (more on these below). Nearby on the site is the cryoplant that will supply and manage liquid helium, the crucial ingredient for chilling the tokomak’s magnets to near-absolute zero (the precise temperature is -269°C), keeping their superconducting electrical coils in a state of zero resistance. This makes it possible to maintain the titanic magnetic fields that both keep the plasma squeezed tightly, and accelerate its component particles (nuclei of the heavy hydrogen isotopes deuterium and tritium) to enormous speeds (corresponding to temperatures of 150×106°C, ten times hotter than the centre of the sun). Temperature and confinement are the two most crucial conditions necessary to force the particles, which all carry identical positive electrical charges, to overcome electrostatic repulsion and collide with each other with enough momentum for them to fuse together into helium nuclei, releasing the energy that is the raison d’être of the project. The cryoplant, the world’s largest, includes three identical refrigerators which will liquefy some 25 tonnes of helium gas to supply the magnets and the vacuum pumps. Capable of a liquefaction rate of 1,230 litres per hour, these refrigeration units are fed by 18 compressors. Another refrigeration plant containing two units will produce liquid nitrogen from the air, which will act as a pre-cooler in the helium plant and will also chill the tokomak’s thermal shield, reducing the load on the superconducting cooling system. Perhaps most exciting of all for visitors are two buildings where manufacture of real components is under way. In one, contractors from Indian engineering conglomerate Larsen & Toubro are welding huge steel components together into the tokomak cryostat. Already giving the impression of being Colosseum-scale, this will be the biggest vacuum vessel ever built, 30m in width and height, weighing a total of 3850 tonnes, and enclosing a volume of 16,000m3. It will maintain the thermal shield, and will also keep its interior at a pressure of 10-4Pa. 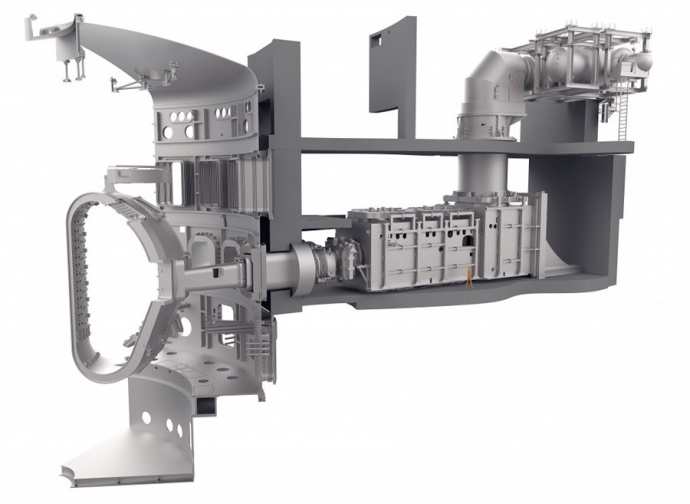 The biggest contribution of India to the Iter project, the cryostat components will be the first and last pieces of the fusion machine assembly to be installed in the tokomak pit. The installation of the cryostat will be a staggered process, and its assembly is too. The sections of stainless steel are being welded together into four very large components. The first to be installed is the base, whose lower plate, shaped like a wide, flat dish with an upturned rim, is complete. On top of this will go the pedestal, a shallow cylinder topped with a flat rim; the 25,000 tonne combined weight of the tokomak itself and the rest of the cryostat will bear directly onto this component. The thickest metal in the cryostat is found in the pedestal — 200mm — which is now undergoing final welding and is being finished directly above the baseplate, onto which it will be welded before the whole base assembly is lifted into the pit. 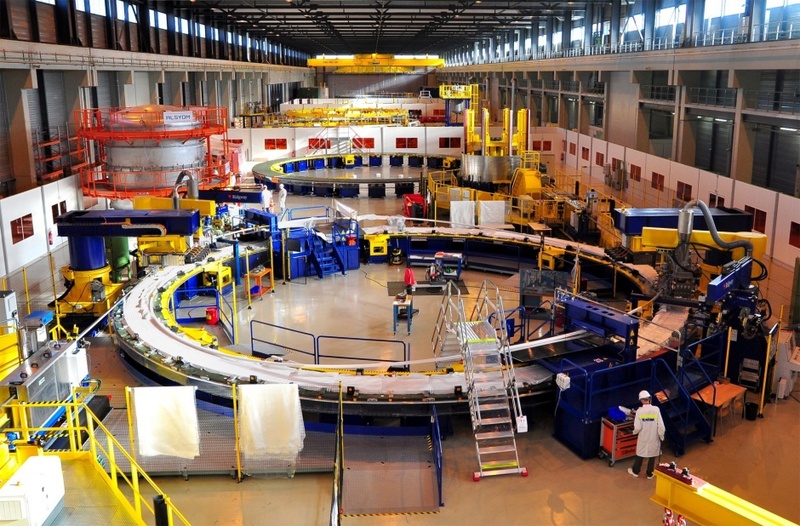 The base is the heaviest single component of the fusion machine, weighing 1250 tonnes. On top of the base will sit two cylindrical tiers with an internal diameter of 28m. Both tiers have holes matching those of the bioshields, which will be connected to instrumentation and equipment by leak-tight bellows. On the lower of these, the first welding pass to link the pieces together is completed; the second welding pass will complete the joints to ensure leak-tightness. The parts of the upper tier are currently arriving from India. The final component, the lid, will be last to be assembled and the last piece of the fusion machine to be put in place. Not far away from the cryostat hall is a facility that was cavernous and intimidatingly empty on my last visit. Here, the poloidal field coils of Iter are being wound. Iter will have three sets of magnets: the central solenoid, a pillar that will sit in the middle of the torus and is important for driving a current around the plasma. Toroidal coils, which occupy the position of lines of longitude on a globe and are the main method for squeezing the plasma; and poloidal coils, which occupy the lines of latitude will help to stabilise and shape the plasma. The six poloidal coils are among the largest and heaviest components of the whole assembly, and apart from the top and bottom coils are too big to be transported to the site from an external manufacturer, so the four middle coils, with diameters of 24 and 17m, must be wound on-site with only their component parts — a cable formed from strands of superconducting niobium-titanium alloy, bundled and packed into hefty stainless steel conduits through which liquid helium coolant will circulate. Though the steel is some millimetres thick, this cable arrives at the site wound onto huge 20 tonne reels; it is then laboriously unwound, cleaned, straightened, and forced into a more gentle curve to form the flat hoops of the poloidal coils. Like many of the operations that will form Iter, this is a sequential process. The coils will be deployed not singly but in winding packs, each pack consisting of multiple ‘double-pancakes’ of two identical coils; and building these packs is complicated. While being wound, the coils are wrapped in glass fibre insulating tape in an automated process where the winding speed and tension are carefully controlled. 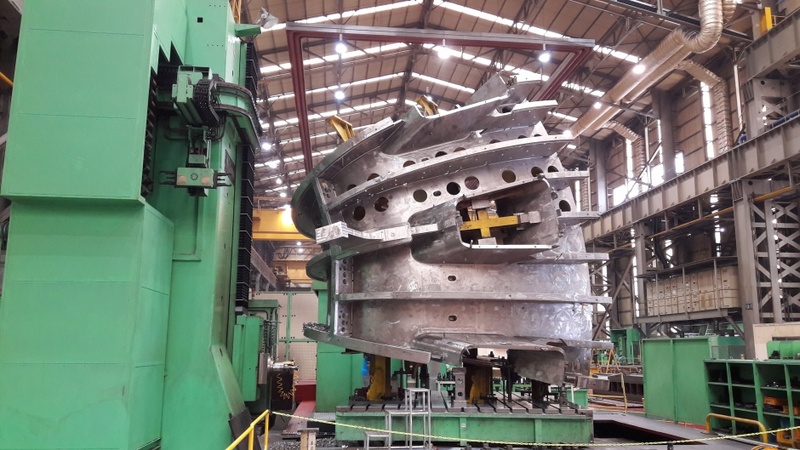 The completed double pancake, the largest of which now weighs 37 tonnes, is then lifted with the magnet assembly building’s overhead crane into a mould, where it is impregnated with epoxy resin under pressure. The number of double-pancakes in each magnet pack is determined by position, from the bottom of the machine magnet packs. 1, 3, 4 and 5 have eight double pancakes, while pack two has six and pack 6 has nine. To form the packs, solid double-pancakes must be stacked together, undergo an additional vacuum resin impregnation step, and have additional components such as clamps, protective covers and liquid inlet and outlet pipes added. Progress on on-site magnet production is now at a stage where the first vacuum impregnation processes can begin. Off-site, pack 1 (the smallest and upper-most poloidal coil) is now halfway through production at the Srednenevsky Shipbuilding Plant in St Petersburg, with its fifth double-pancake being wound and the first two having now completed vacuum impregnation. The third double-pancake was being impregnated as this article was being written. The building sequence that will lead up to the completion of the fusion machine is now clear, but it won’t be quick. First, the remaining construction of the tokomak building itself must be completed, so that the rails of the crane in the assembly hall can be extended over the tokomak pit. Completion is expected by the end of 2018. Then the wall between the assembly hall and tokomak hall (currently towering over the tokomak pit and adorned with a huge poster showing a cutaway diagram of the fusion machine) will be demolished, and the neutral beam equipment installed. The base of the cryostat will then be lowered into place early in 2019, followed by the first two poloidal field coils. Assembly of the tokomak vacuum vessel itself can then start. The first stages of this part of the assembly process have already begun in the assembly hall. The floor of the hall is being prepared for the arrival of two vacuum vessel sector sub-assembly tools, which are being built by Taekyung Heavy Industries in South Korea. The ground-level supporting components of the tools are now grouted into position, and the components of the tools themselves are now arriving at Cadarache. These tools will themselves be mammoth components, 22m tall, weighing 800 tonnes and with two hinged hydraulic ‘wings’ that can open to a width of 20m. The role of each tool is to suspend a 40° slice of the toroidal vacuum vessel (seven are being forged in Italy; the other two in Korea) in a precise position, while the wings will suspend two toroidal field coils and thermal shield components, sliding them around the outside of the vacuum vessel sector where they will be fixed into position, along with associated thermal shielding. Assembling the sectors is a task requiring extraordinary precision, and the assembly tools will be heavily equipped with sensors to measure the relative positions of the components as they are hoisted into position, manoeuvred and welded into place. It will take both of the assembly hall’s overhead cranes working in concert to lift and move the assembled sectors, which will weigh 1200 tonnes each. 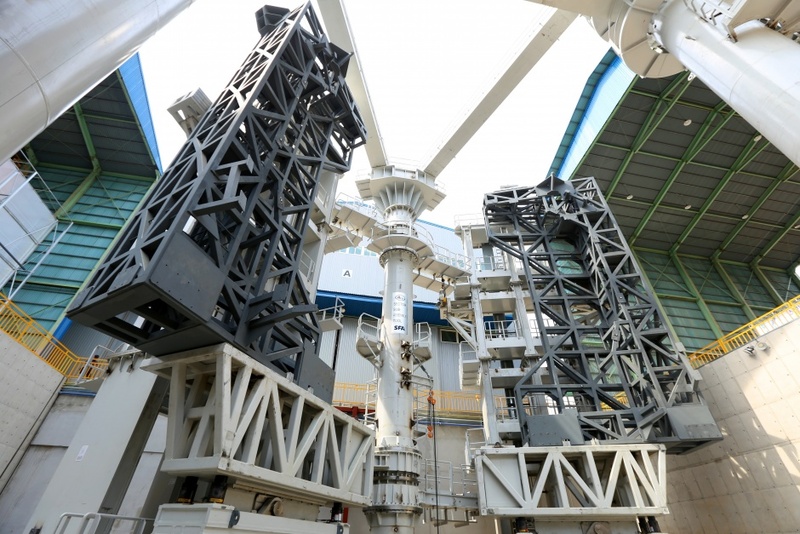 Once the nine sectors of the tokomak – each a vacuum vessel/toroidal field coil/thermal shield assembly – are in place and welded together, the remaining four poloidal coils will be hoisted into position, followed by the upper and lower tiers of the cryostat. The central solenoid, being made in the US, will then be craned in and installed (the ceilings of the tokomak and assembly halls are twice the height of the fusion machine to allow clearance for this component, which runs the full height of the vacuum vessel). Then it’s time for the final component, the cryostat lid, to be installed. In-vessel assembly can then begin, carried out by hand and by an array of robotic equipment, installing equipment to put the tokomak in its initial configuration for first plasma in 2025. In order to produce a burning plasma — a state of self-supporting nuclear fusion in the hot soup of charged particles circulating inside the vacuum chamber, which has never before been achieved — the plasma must be heated. There are three ways of doing this. The first is to induce a current around the plasma, which is achieved using the magnet systems (mainly the central solenoid); and two external methods: microwave — or radiofrequency — heating, of which Iter will use two types; and neutral beam injection. Neutral beams are jets of electrically-neutral hydrogen atoms, accelerated at high speed into the plasma, where they give up their energy by colliding with the particles of the plasma. They have to be uncharged, or they would be deflected out of the plasma by the magnetic fields. But to be accelerated at all, they have to be charged, so neutral beam injectors work by stripping an electron away from hydrogen atoms, accelerating them with linear magnetic fields to a high velocity, passing them through a gas chamber where they reacquire their lost electron without losing momentum, then sending them into the tokomak. This is proven technology — most tokomaks use it, including the Joint European Torus in the UK, but Iter’s system will have to accelerate atoms three to four timers faster than any previous injectors, for them to penetrate deeply enough into the plasma to be effective. The faster positive ions are travelling, the harder they are to neutralise; so Iter will use injectors which make and accelerate negatively-charged ions — the first time this method has been used. Negative hydrogen ions are less stable than positive ones, so easier to neutralise but harder to handle. Iter will have three injectors; two for heating and one for diagnostics. Each of the two heating injectors will be able to supply 16.5MW of power at 1MeV of energy, in pulses up to an hour long. The hardware is being developed art a facility in Italy called PRIMA, which houses two test beds: SPIDER, for the development and characterisation of the negative ion source, and MITICA, a full-scale prototype of an injector. Europe, Japan and India are all contributing to this effort, and the last components for the Japanese contribution to MITICA — parts of the power supply — were delivered in November. At the other end of the industrial spectrum, Siemens and Hitachi are collaborating on developing an ultra-high voltage deck and bushing for the injectors. Operating at 1MV DC, weighing 100tonnes and requiring seismic qualification, it is well in excess of anything used in industry. Once again, my question is simple. Are there any amongst our leaders who have the slightest idea of what is being developed here? and would have any concept of its complexity and that of the project management necessary for its successful completion? How much longer is the ascent of mankind to be left (should that be right?) in their hands? And those of the other conflict groupings. Mike, the answer is really NO they are only elected for several years, then gone. The permanent Civil Service walleys; are feed information/data from those involved in the design/ideas/engineering and craft it into What THE various Minister’s) wants to HEAR ,not necessarily need for a good policy decision! It is like continuous research based on an idea, which can be good for mankind. Several folks have stated that when it is started in 2035 the next ones could? be less expensive and easier to build? In the meantime alternative Energy sources should be further developed, such as the Norwegian and UK THORIUM salt reactors; as small scale factory built Microgrid units – these reactors can reduce the existing spent nuclear fuels around the world at the same time. These reactors could be built, up and fully capable before 2035, if there’s a Will by various Government departments – the manufacturing of these thorium reactors utilizes the same engineering/manufacturing process as the Iter system. Thus if there is a problem once started that needs further research. These small Thorium reactors can continue to be built and will still supply the needed Energy! These two technologies need to be run side by side till Fusion is fully proven and reliable. Governments need to be courageous and take the plunge before it is too Late! A few corrections to this, Geoff: nuclear reactors are considered to be on their 4th generation, not 8th. There is currently no active thorium salt reactor programme in the UK, and there is little commonality between thorium salt reactors and Iter. “the most complex machine ever built” What confidence does this give that fusion will ever be a coat effective source of energy? Is there any hope that costs can come down sufficiently? It’s a valid point. Future machines could well be less complex — they will have much less need for diagnostics, and the experience of running ITER may lead to a simpler magnet design with more streamlined methods for stabilising plasma. Less expensive superconductors which don’t need liquid helium temperatures are being developed. But fusion machines will almost certainly always be complex and require specialised materials. Cost and complexity will definitely be issues, although it’s possible that not all countries would need them, particularly in the developing world. Presumably the UK is turning it’s back on this exciting project as we leave the EU? Still to be determined. We’d have to join as an associate member of Fusion for Europe, like Switzerland, or as a completely separate nation, on similar terms as the US, Korea, Japan or India. At the moment, the UK government’s stated intention is that we remain involved. Reading the above there seem to be a lot of countries involved in Iter that are not in the European Union. I haven’t heard anything of DEMO for quite a while ! I am often give to wonder if we had spent all the money that has been lavished on fusion research, that has been “30 years away” since the 1950s, on renewable energy such as solar, wave, wind and tidal. Would there still be a need for fusion? How about hamster wheels as well. The simple answer is that this will always be a hypothetical. Good developments to push technological boundaries, but a big oopsies if it overheats and goes bang? The sun’s great, but I wouldn’t want it beside my house. Fusion can’t overheat and go bang. The easiest way to think of it is that wuith fission, everything you do is to slow the nuclear reaction down and stop it overheating, and the reactor has a large amount of fuel in it; with fusion everything you do is to keep it going. There’s a very small amount of fuel in the reactor at any one time, and the tendency of the reaction is to stop. It seems that this is unnecessary to me and very expensive when we have an natural massive fusion generator on our door step. We just need more efficient solar cells and maybe a paradigm shift in renewable tech. Fusion seems like a very expensive solution to energy generation when the drive should be to relentlessly reduce energy costs – but this doesn’t fit the economic model driven by profit and greed. An important point. However engineers are rightly loathe to trust the future to an as yet undefined paradigm shift. Conventional solar cells for example have a fundamental limit on their efficiency placed by the laws of physics. So until that paradigm shift work will continue on process conceptually proven the first time we built a H bomb and maybe, just maybe, allow us to produce energy for longer than the lifetime of the sun. Great article on this massive new development. This hasmany similarities to CERN, which I visited a few months ago, in being dependent upon state of the art cryogenics and a lot of advanced engineering. These projects are to a large extent “acts of faith” and can only be justified (like space exploration) as worthwhile human challenges with potential long term benefits: the time to worry is when these projects do not go ahead. There appears to be a bit of a revolving door between Cern and ITER, especially in cryogenics and magnets. I am looking forward to the pre start up trials. Electric vehicle owners can’t wait for Iter to power up and are having sleepless nights listening to all these primitive pessimists !! I agree that this research must go ahead. The cost in terms of energy required to produce machinery for wind, tide, solar etc. is often ignored when there is talk about these forms of energy, and the problems of energy storage have not been resolved satisfactorily. I believe the future has to be with nuclear fusion.